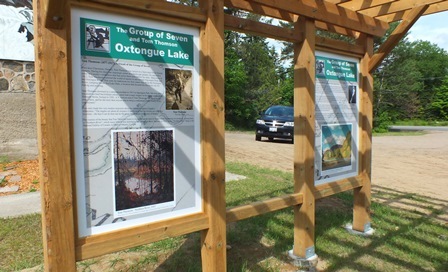 This outdoor exhibit is designed to showcase the connection between the Oxtongue Lake community and the illustrations that the Group of Seven and Tom Thomson created depicting the area. Come on out and read about the painters and their work in the area. Inspired by the Group of Seven Outdoor Gallery mural paintings in Huntsville, members of the Oxtongue Lake Community Center Committee, (OLCCC), spearheaded an initiative to have a mural located at Oxtongue Lake. The mural proved to be a highly successful community project funded entirely through community donations. The large-scale mural of A.J. Casson’s, “Oxtongue River” (Ragged Falls) was completed at the Community Centre by mural artists Gerry Lantaigne and Janine Marson, with many brushstrokes added by community members. The completed mural was mounted on the Centre’s southern exterior wall in November 2012.